After years of utter confusion about the legality of electric bicycle usage in New York City, the police have finally been given the order to bring down the hammer on the e-bike riding community, handing out tickets to or seizing bikes from owners. This will prove devastating for recreational e-bike riders and those who use the pedal-assist transports for business, as the city's previous ban had been initially unenforceable for 12 years. Now that things just got real, what are e-bike riders expected to do? What does one do when suddenly in possession of an illegal piece of machinery that you may depend on using? As stated by MultiBriefs previously, New York City and e-bikes have not meshed well in the past. In 2004, the New York City Council made e-bikes illegal, despite the fact that the federal government had already lumped two-wheeled machines with small electric motors and a speed ceiling of 20 mph along with ordinary bicycles two years prior. The New York government chose to simply ban any and all motorized vehicles that couldn't be registered with the Department of Motor Vehicles. This only served to foster confusion and chaos among police and riders alike, as people seemed unsure of what was an illegal e-bike. As a result, enforcement of the law had been lax. As of July 2015, police have been given the orders on how to carry out this new power. According to a New York Daily News exclusive, as of July, "cops have been given orders on how to issue tickets and seize the scooters seen buzzing up and down city streets and sidewalks. The goal is to increase 'public safety by enforcing laws pertaining to the use of motorized scooters/electric bikes,' [NYPD documents] show." New York City officers are giving out environmental control board violations and a $500 fine to those they catch using the machines. New York City's ban on e-bike usage has been met with protest since its inception. 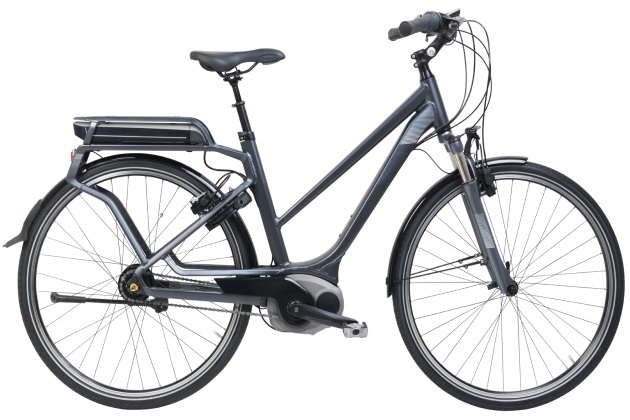 Along with recreational users, many businesses within the city use e-bikes and other types of motorized forms of transportation for deliveries. Their business' bottom lines will be affected if they suddenly have to replace easy-to-pedal e-bikes with the old-school nose-to-the-grindstone style of transport. In an industry such as food delivery — where arriving on time, no matter the terrain, is of utmost importance — this will not do. For example, 52-year-old New York deliveryman Jason Shi has used an electric bike to work two jobs. According to WNYC-FM, Shi was forced to drop one of his jobs after the ban, losing more than half of what he earned before. "We are not a criminal," he said during the interview — speaking through an interpreter. "We just do delivery work on the street." Last year, The Chinese Staff and Worker's Association, a nonprofit, nonpartisan workers' rights organization, has been working to turn back the law. As of 2015, these efforts haven't seemed to yield any fruit. People then weren't really obeying the ban anyway. According to a media report on the matter, despite the 2004 law that banned the sale and renting of e-bikes in New York City, many Manhattan and Brooklyn shops continued to operate. If one thinks about it, what were these businesses expected to do? They have inventory that still needs to be moved, and if the city wasn’t enforcing the ban, why should they lose out on profit? As per the report, "the businesses [continued to] openly sell e-bikes from anywhere from $1,200 to $4,000" with authorities doing little to nothing about it. According to Damon Victor of Greenpath Electric Bikes in Brooklyn's Sunset Park, "They came in [at one point] to approve the fact that I was doing it correctly." So what does one do now that the NYPD is threatening to either ticket or seize once-legal e-bikes? Most e-bike owners aren’t going to just get rid of their beloved property, so the only real option is to find a way to ride without running afoul of any law. This can be accomplished in a number of ways and, while breaking the law is never recommended, there are methods for avoiding an officer's attention and remaining conspicuous. Although some of the ideas offered by electricbike.com may seem a bit on the "sketchy" side as far as legality is concerned, one piece of advice that should resonate with every e-bike rider is to know the e-bike laws in one’s state. This applies to New York riders as well as those in other jurisdictions with murky e-bike laws and enforcement. The first thing every owner should know is whether his or her e-bike is legal in that jurisdiction. Doing research is paramount; some states have perfectly understandable and fair e-bike laws. New York, on the other hand, holds a position on e-bikes that has less to do with safety and legality and more to do with the jurisdiction's confusion on how to regulate them. It’s unfortunate that owners are now put in a position where they may feel forced to either stop using their e-bikes or adapt to a law that was inherently crafted in ignorance. Ryan Clark is a content editor at MultiBriefs specializing in the automotive and transportation industries. Previously, Ryan worked as a Washington, D.C., disability and leave journalist covering federal and local government, Congress and the Supreme Court. He has also worked as an online editor, covering the passage of the Affordable Care Act, Maryland laws, sports and sports entertainment.